VMO-251 was commissioned at NAS North Island on 1 December 1941. Ironically, the first CO (for 11 days) was Capt. Elliot Bard who subsequently was CO of VMD-154 during it deployment to the South Pacific combat zone in the Fall of 1942. Clearly, VMO-251 can lay claim as being the first USMC reconnaissance squadron although its first year of operations involved so many varied missions that the squadron patch depicted a war-like octopus! It wasn’t until 1 May 1942 that a decision was made to transfer some Navy F4F-3 Hellcats to the squadron for conversion to the F4F-3P photo reconnaissance variant by the co-located support facility. The modification involved replacing the reserve fuel tank behind the pilot with two aerial cameras. This decision was quickly followed by a warning order to prepare to embark aboard transports for the South Pacific to support impending 1st MARDIV operations. The advance party including most of the pilots, mechanics and photographers departed on 17 June under their CO Major John N. Hart with a few of the F4F-3Ps partially dismantled for shipment. Their ship arrived at Noumea, New Caledonia early in July and began to set up at Tontouta airfield about 35 miles away. The CO reported to COMAIRSOPAC (RADM McCain, the grandfather) who a couple of weeks later ordered him to begin training for air defense missions as their aircraft retained their guns and didn’t as yet have extended range tanks. McCain no doubt was concerned about local air defense as on 15 July the Japanese hit Tontouta with a mini-Pearl Harbor like raid destroying or damaging 45 aircraft perhaps some of Hart’s F4F-3Ps which were being put together there. By coincidence, Lcdr Quackenbush, a classmate of Hart at Navy Photo School, had also just arrived and assigned as the Admirals photo officer with direction to get pre-invasion photos of Guadalcanal, albeit he had no photo aircraft! He commandeered 2 USAAF B-17s, modified them with Navy aerial cameras, and enlisted two of Hart’s photographers to accompany him on a crucial 27 July mission to get a mosaic of the landing areas and defenses of Guadalcanal, some 1000 miles to the North. Miraculously, they did so despite being attacked by Japanese float planes (they shot down several), and having to land on another island. The film was flown back to Noumea via PBYs, processed and then flown out to the Marines’s flagship by a PBY flying boat. When the Guadalcanal landing order was received a few days later the squadron was ordered to move North to the island of Espiritu Santo where it was to assume the primary air defense role and provide airbase support for the 11th Bombardment Group’s B-17s supporting the invasion force, over 500 miles North. The advance party arrived on Espiritu Santo on 4 August, just 3 days before the landings, oddly enough on the same transport that had just arrived with the remainder of the squadron and its equipment. Luckily, the island was at the outer range of Japanese bombers as it was some time before a creditable air defense capability was established. From August through November, VMO-251 performed about every mission in the book, from full service air base support, ferrying combat aircraft back and forth to Guadalcanal and other bases, providing aircrews for observation missions on cruiser-based aircraft, and of course continuing to provide photographers for the USAAF B-17s. They also assisted Lcdr Quackenbush in setting up his photo lab on the island. On 10 August, the XO and a small detachment flew to Guadalcanal to lead the effort at Henderson field to prepare for MAG-23’s aircraft. 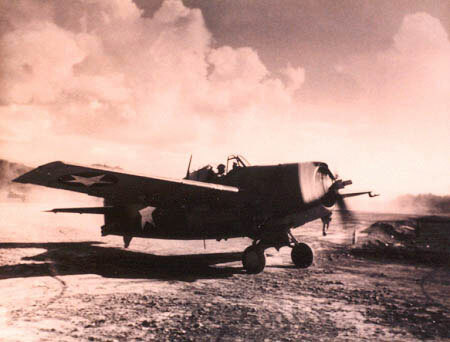 MAG-23’s squadrons and others of the famous Cactus Air Force proved instrumental in staving off the relentless Japanese assaults against the Marines when the Navy aircraft carriers were forced to withdraw. Two of VMA-251’s TAD pilots were lost when their ships were sunk during the Japanese attacks on the night of 8 August. Many of VMO-251’s pilots were involved in combat action as they came and went over the first 3 months. In early October, a newly arrived F4F-7P photo reconnaissance variant with extended range tanks but no armament was ferried into Guadalcanal and Capt Longley and a support team was sent TAD to fly it. This likely was the first dedicated USMC photo reconnaissance aircraft to enter combat as there is no mention of the squadrons F4F-3Ps making it to Guadalcanal before then, and VMD-154 didn’t arrive with its B-24D/PBY4-1 dedicated photo reconnaissance aircraft until later at Espiritu Santo. In December, VMO-251 under a new CO was nearly completely reorganized as a fighter squadron and eventually in February 1943 moved to Guadalcanal presumably still with at least some of its photo variant aircraft. 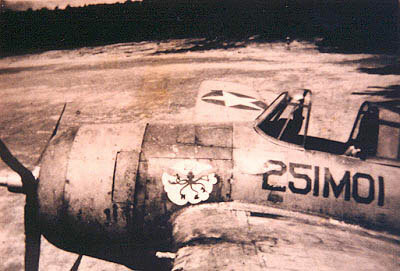 VMO-251 departed the combat zone later in 1943 but was to return as a fighter squadron in 1944 although not being redesignated as VMF-251 until January 1945. VMO-251 received a Presidential Unit Citation for the period 7 August – 9 December 1942, and a citation from the USAAF 11th Bombardment Group for supporting its photo reconnaissance missions.